As the impoverished residents of Amatrice moved to Rome in the eighteenth and nineteenth centuries, this recipe came along with them; today it is as Roman as the Colosseum, but you would never know it. Throughout America, 99 percent of Italian restaurants have this tubular-spaghetti dish on their menus, so it might as well be American now. You can use garlic here instead of onions, as the original recipe calls for. But unless your amatriciana contains guanciale (cured pig jowl), you are not even close to the original. Since pig jowl is not found in every corner store, making the dish with bacon or pancetta will yield delicious results as well. 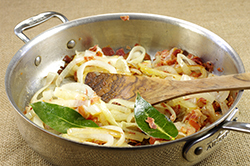 In this recipe I used onions, as in most of the American amatriciana recipes, but the bay leaves are my addition. 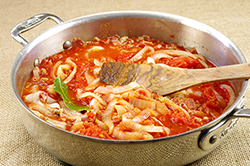 The precursor to amatriciana sauce is sugo alla gricia, which does not contain tomatoes. The dish seems to have roots before the discovery of the New World; tomatoes came back from there to Italy. The gricia sauce contains guanciale, coarsely ground black pepper, and grated pecorino cheese to dress the pasta. 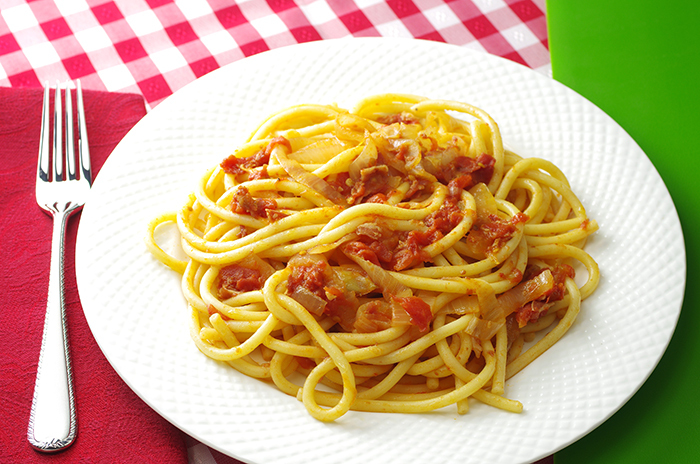 This dish is still made today and is very popular in and around Rome, where it is called pasta alla gricia. Bring a large pot of salted water to boil for pasta. Slip the bucatini into the water, and cook until it is al dente. Heat olive oil in a large skillet over medium heat. 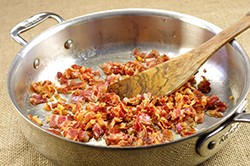 Add the bacon or pancetta, and let the meat render its fat until the edges begin to crisp, about 3 to 4 minutes. Add the sliced onion and the bay leaves, cover, and cook until the onion begins to soften, about 3 to 4 minutes. 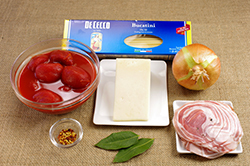 Uncover, and sprinkle in the peperoncino and tomatoes. 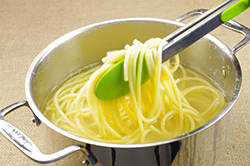 Slosh out the can with 1 cup pasta cooking water. Add it to the sauce, and stir. Season with salt, bring the sauce to a simmer, and cook until thickened, about 10 to 12 minutes. 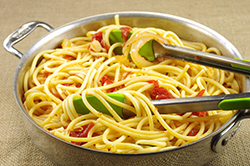 When pasta is ready, transfer to the sauce with tongs. Cook and toss the pasta in the sauce until all of the pasta is coated. Remove from heat, and toss with the grated cheese. Serve immediately.